At Hive, we don't want you to just manage projects, we want to empower your team to manage its productivity. With Hive Analytics, your team can access dashboards that visualize critical business insights and trends about productivity. With these insights, you can respond quickly to potential problems and identify opportunities to improve. Time Tracking: Key insights into how your team track and estimates time. Please note that you will only see information about projects of which you are a member and team members you work with. This is to protect privacy. For new users, we also provide three sample dashboards. These provide in-depth descriptions of what each widget means. It's also helpful to see what they look like when your team has accumulated a sufficient amount of data. If your team is interested in purchasing a custom dashboard, please contact our customer service team at help@hive.com. 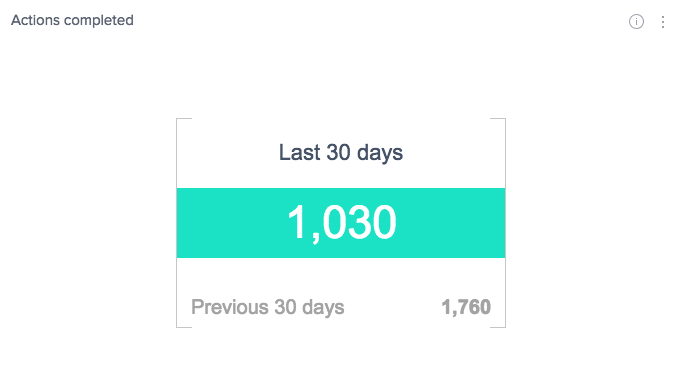 To move from one dashboard to another, you can use the drop down menu at the top of the Hive Analytics screen. 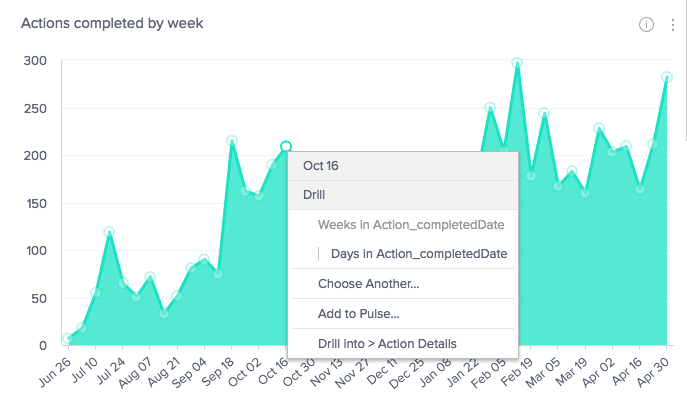 Hive dashboard provides an overarching view of you and your team's productivity. But you can still dig into the details. Almost all widgets in the dashboards allow you to the individual actions associated with a metric. How you access them depends on the widget. 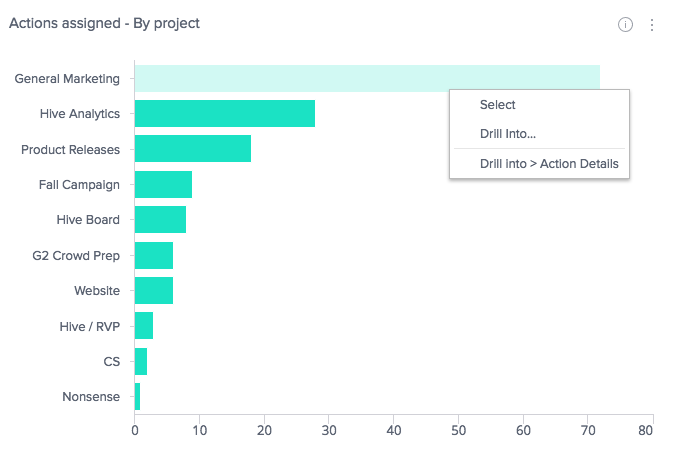 Line chart: click the data point you want to see and select "Drill into > Action details"
Bar chart: right click the item you want to drill into and select "Drill into > Action details"
It will open a new window that shows all the action details. These details vary based on the dashboard you are looking at, but it will include data such as action title, assignee, project, etc.